Been at the noise fest dedicated to space. It featured russian projects Cisfinitum, Kryptogen Rundfunk and Ritualnaya Bioengeneria. It was rather nice gig. 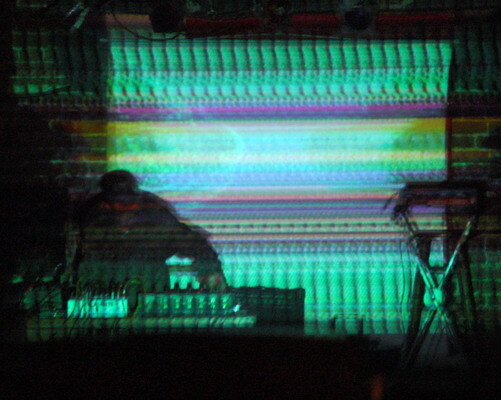 I liked KR for its solid dronenoise and RB for rather proper and energetic shamanic noise/ritual. Overall it was proper brain cleaning and i’m glad to see that the russian noise/experimental scene doesn’t stagnate and developing constantly. Hopefully this autumn will bring more such nice gigs, it’s hot season for that. At last! I’ve finished tinkering with php and css so you can enjoy this new and shiny site. I’ll polish it more with time, fix some links, add tiny new features and maybe themes. Oh and I hope here’ll be new content ;) But for now it’s just all new dynamic engine in all its glory! No more messing with html with every update! Big thanks goes to WordPress and Gallery2 teams for their efforts and great engines! Last weekend was filled with noise. 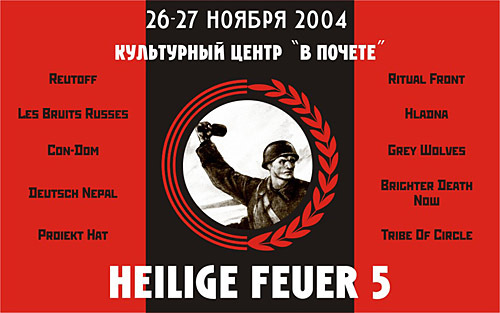 I’ve been at the industrial fest “Heilige Feuer V” wich happens early, and this time it happened in Moscow instead of St.Petersburg where all the previous 4 fests took place. Anyway, apart from the bad organization I’ve got my piece of pure and raw energy from some bands, but let me describe everything in order. 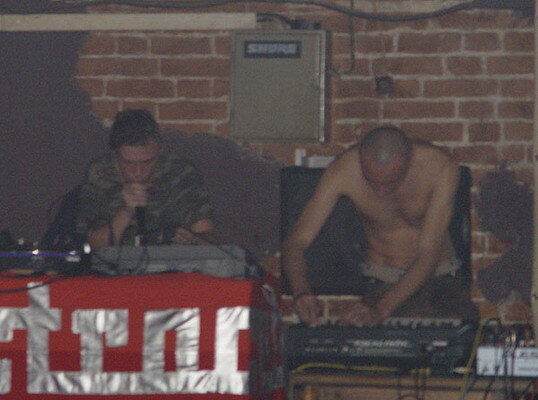 The first were Moscow band Reutoff. I was never big fan of their work because I haven’t seen purity in it. It was all cheap tricks and everything smelled with plagiarism and vulgarity. That’s my point of view, maybe someone is big fan of this band, but not me sorry ;) With their new program their sound changed to something more rhythmic and pop (like dark electro/rhythm noise). I couldn’t resist to think about them taking popular ideas and using them just to keep interest in them. I cannot stand that. Next were Les Bruits Russes, which actually use another name on other gigs (The Noises of Russia, spelled in russian). Again, I cannot get the band’s idea. They generate rather nice sound, but they use female vocals and someone who reads weird instructions for medics and morgue staff. These wicked female voices and persistent reading of the instruction together with heavy noise looks and sounds pathetic for me. Next was Proiekt Hat. I never heard this swedish project before, but heard that it was strictly cassette/vinyl underground one, so it was interesting what he was going to show. It turned to be rather nice noise/industrial with perfect video showing some industrial scenes, old caricatures showing capitalists and US military, etc. The only flaw is that it wasn’t that loud. In fact, it was very quiet. Anyway, I’ve enjoyed this project. Next were the elders of the noise scene – The Grey Wolves. Their performance was very powerful and full of energy and hate. I liked it the most. Their video was japanese movie – Tetsuo – Iron Man, which I haven’t seen before and wich startled me by its brutality and wickedness. Along with harsch power electronics it created special atmosphere. I’d say that The Grey Wolves where the best band of the first day. So, it was the first day. We returned home somewhere about 7am and were expecting second night with anticipation of something even more brutal. And it turned that our expectations didn’t fail us. The next day started with someting weird. Imagine, stage was filled with people from various projects: Reutoff, Der Blutharsch and Les Bruits Russes. It turned that planned earlier performance of The Tribe of Circle with Der Blutharsch got canceled because they weren’t able to get visa for The Tribe of Circle guy. So, the spontaneous performance followed. Well, what can I say. Only 3 pieces were performed wich were weird. I can find the reason of this. Seems like people were rehearsing only one day before the gig and one cannot expect something worthwhile with such a raw program. It’s a pity because I expected to hear proper Der Blutharsch. Next were Ritual Front – russian neofolk project which I spent being out of the scene part of the hall relaxing at the bench with my gf ;) As I heard it, Ritual Front were monotonous and very serious. Maybe they were good for the neo-folk people, but it’s not my cup o tea. Next was Con-Dom. Harsh noise from the UK. I liked this band the most. Here was pure provocation, hate and energy. I’m still under influence of this performance. I never was a big fan of the power noise, but after meeting it live I got hooked. Live power noise is something special indeed. I wish here would be more such gigs. The next and the last participant was Hladna from StPetersburg. I’ve seen him at the other show so I was aware of what to expect. Indeed, it turned to be rather nice electro/noise. The guy used iron sheet as noise generator. He moved toys on it and it created rather loud and harsh noises. The show was rather original. So that’s it. The fest was over somewhere about 4am and we headed home being charged by the mental energy and exhausted physically. Afterall, the fest was good, but I think it was good because there is no alternative to compare with, which is bad… I wish it would be more industrial gigs here in Moscow. And don’t forget to check images here. Gallery 2 is released at last. So I didn’t wait long and updated my old and faithful Gallery 1. I’m going to make proper color scheme and layout for it in the future so it’ll match my new site design which is also in development. Metlslime has released nice oldskool looking level titled “Antediluvian”. It uses “Wind Tunnels” theme and atmosphere and has very quality brushwork. Go get it! You are currently browsing the Zero Credibility weblog archives for September, 2005.